Major auto companies are now close to bringing their first electric vehicles onto the market. But in many cases these new vehicles are as big and heavy as their gasoline powered brethren, and consequently burn just as much energy even though they take it from batteries rather than a fuel tank. In the greater scheme of things, I’m not convinced that helps us very much. I believe there is instead a bright future for a spectrum of ‘micro’ electric vehicles, from battery powered bicycles up to compact size cars, including this new concept car named Trev (Two-seater Renewable Energy Vehicle). Conventional cars use a lot of energy. Try pushing one. The larger and heavier the car, the harder it is to move and the more energy it uses. Typically, less than 15% of the energy that reaches the wheels is used to move the occupants; the rest is used to move the machine. Most of the time, we use our cars to travel short distances in slow city traffic with only one or two people in the car. But we do it in cars that are capable of carrying four or five people across a continent at 100 km/h or more, and towing a boat or caravan at the same time. We need something new. Something appropriate for city mobility. Staff and students at the University of South Australia have designed and built such a car, which we call Trev (Two-seater Renewable Energy Vehicle). 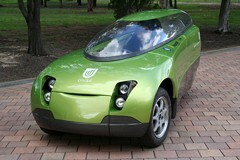 Automotive companies are developing electric versions of conventional cars. But they are still large, heavy cars, and still use a lot of energy. Rather than take a conventional car and try to make it clean, our approach has been to take a clean, low energy vehicle — a solar racing car — and make it practical. Solar racing cars can cross a continent at 100 km/h (60mph) powered only by sunlight, so it should not be too hard to build a clean, efficient vehicle that can transport someone to work and back each day. * 150 km of city driving before the car must be recharged. Most importantly, it uses less than 1/5 of the energy required by a conventional car. And it doesn’t look too bad either. * The tandem seating layout gives good aerodynamics, good balance, and good vision. * The acrylic canopy gives the driver an unimpeded view of the road. * The canopy and door open on the kerb side of the car. * The electric motor gives smooth, quiet acceleration from 0–100 km/h (60mph) in under 10 seconds. * A composite tub chassis, with foam and plastic body panels, gives a total car mass of 300 kg. * A 45 kg lithium ion polymer battery gives over 150km of city driving. * Low-energy tyres on low-mass alloy wheels give low rolling resistance. * The single rear drive wheel simplifies the suspension, and allows a simple, efficient transmission. 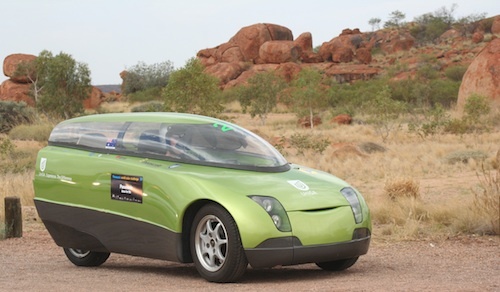 In October 2007 we drove Trev from Darwin to Adelaide in the Greenfleet Technology Class of the World Solar Challenge. For most of the journey, we drove 80 – 120 km at speeds of 80 – 90 km/h before stopping to recharge from a generator. We completed the 3020 km (1900 mile) trip in just over six days. Our energy consumption was 6.2 kWh/100 km. Electricity costs about AUD $0.18 per kWh. The cost of recharging Trev is 1.1 cents per kilometre [Approx 1.6 US cents per mile]. The entire 3000+ km journey cost us $33 of electricity. It makes petrol (gasoline) look silly. Team Trev is a motley collection of EV enthusiasts, innovators, tinkers and travellers. We’re volunteering together to take Trev to the world. * get the car registered. The key design concepts will not change. There’s a lot to like about Trev, and with batteries just a fraction of the size, it wouldn’t have the price tag of a Chevy Volt either. Or if you can cope with the elements, the electric bicycle end of the spectrum will suit everybody’s budget and still cover a fair bit of ground. Today’s monsters could be kept in the garage, or shared with neighbouring houses, for the larger shopping and holiday trips where the larger capacity is actually required. So for just 20% of your current energy use, Trev can keep you clean and dry while completing your commuting journey as quick as the roads allow. Now these smaller vehicles won’t solve congestion, although they will help, so I’m also an advocate for a new mindset in city and suburban planning and long-term investment in public transport. But changing infrastructure is a slow response to peak oil. Once fuel costs start to become a significant factor in people’s driving decisions, a car like Trev that is super cheap to run will look pretty attractive. Given the simplicity and much lower resource use of a micro electric vehicle, it’s not hard to imagine the Asian manufacturing industry churning these out once we realise the need for them.